Wouldn’t every day end beautifully if you could crawl into a cocoon and swing away for a while? Inspired by the hanging, tapering nests of weaver birds, The Hanging Cocoon features a semi-enclosed design that provides a peaceful haven for children and adults. 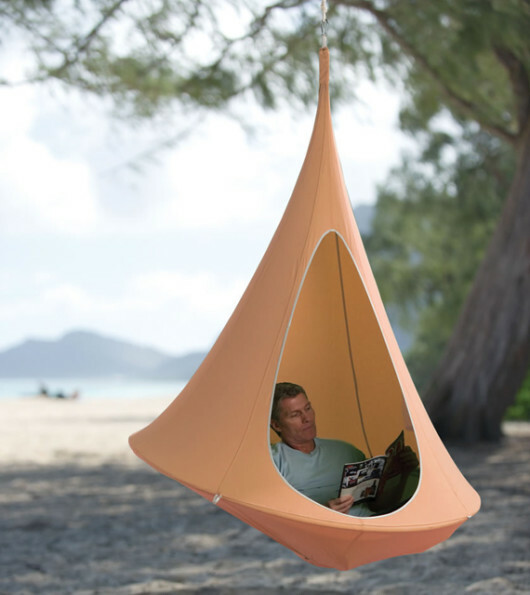 Part hammock and part floating chair, it’s just perfect for reading, relaxing or keeping the kids as happy as can be, safe from the elements, even. This same type of fabric is used to cover yacht sails so, you know it will stand up to any outdoor abuse that comes its way.